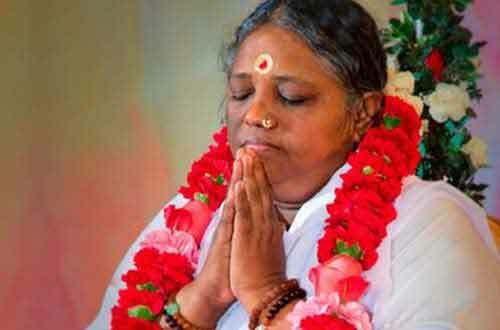 Quotes of Mata Amritanandamayi from various sources. The Mata Amritanandamayi Devi quotes is a continuous collection of quotes of more than 10 years. These 108 quotes are from books, talks, newspaper, magazine articles. 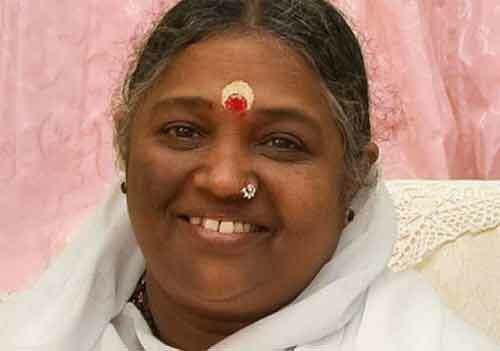 Amma Amritanandamayi Devi is a highly popular spiritual leader with following around the globe. She is also popularly known as Ammachi or Amma. Children live in the present moment. This is why people feel so drawn to them. Unless we have a certain degree of mastery over the mind, true peace is difficult to attain. Your heart is the temple where God should be enshrined. Your good thoughts are the flowers, your good words the hymns, your good deeds the rituals. And love is the offering. To ward off evil tendencies, human beings should develop the ability to accept and nourish healthy thoughts. Violent attitude is robbing away peace and love among human beings. And it is because of nurturing selfish thoughts that society no longer believes in unity, but in individual isolation. This selfish attitude has been firmly entrenched in our minds. Instead, people must attain pleasure by devoting more time in serving society. While striving to take humans to the stars, there must also be attempts to bring back humanity to earth. There are two kinds of happiness and sorrow. When we don't get what we want, we feel sad; but when others get what they wish, our sadness is even greater. Similarly, we are happy when we succeed in something, but we are happier when others fail. This is a serious disease of the mind. Pray for a heart that rejoices in the happiness of others and empathizes with their sorrows. Bliss is our true nature, not sorrow. But something has happened to us where everything has been turned upside down. Happiness has become a strange mood while sorrow is considered to be natural. Real bliss will be attained only when we can discriminate between the eternal and non-eternal. All of us are searching for eternal bliss, but we will not get it from perishable objects. How can anyone who is looking for happiness in the things of the world attain the bliss that doesn’t belong to this world? The happiness that we gain from the outer world is fleeting; it never stays with us for long. It is there one moment and gone the next. But spiritual bliss is not like this. Once the final breakthrough happens, where you transcend the limitations of body, mind and intellect, the bliss is forever and it is infinite. Once you reach that ultimate state, there is no return. We can mold clay in the shape of a donkey, a horse, a mouse, or a lion. Even though they are different in name and form, they are in fact nothing but clay. We need the eye to see the clay that is the substratum of all those names and forms. So, the mode of perceiving the universe through different names and forms has to be abandoned. It is, in fact, the one Supreme Principle that has transformed itself into all those forms. So, in Hinduism everything is God. There is nothing that is not God. Hinduism teaches us to love and serve animals, birds, reptiles, trees, plants, mountains, rivers – everything, even a deadly, poisonous cobra. When we reach the ultimate experience, we realize that this universe is not distinct from us, just as the different organs in our body are not separate from us. Our awareness, which until now has been limited to our body, expands to encompass the entire universe. Nothing is excluded from this awareness. Those who know the Truth experience the suffering and sorrows of others as their own, just as we become aware of pain when our toe is pricked by a thorn. Compassion becomes their true nature, just as heat is the nature of fire, coolness the nature of water, and fragrance and beauty the nature of a flower. Giving solace to others becomes their innate nature. If our finger happens to poke our eye, we forgive our finger and we caress and comfort the eye, because the finger and the eye are not separate from ourselves. Sanatana Dharma does not insist that God should be called only by a particular name or that God can be attained only through one prescribed path. Sanatana Dharma is like a vast supermarket where everything is available. It gives us the freedom to follow anyone of the paths indicated by the great self-realized souls, and even to open up a new path to the goal. There is even the freedom to believe or not to believe in God. All doors cannot be opened with the same key. In a similar way, to open our minds we need different keys to fit our different samskaras and levels of understanding. In Sanatana Dharma, the garment that is made is not cut to the same measure for everyone. Furthermore, for each individual, the garment may have to be remodeled at times, to fit the person’s stage of development. Spiritual paths and practices have to be renewed according to the times. This the contribution the great souls have made to Sanatana Dharma. This dynamism and expansiveness are the hallmarks of Hinduism. Spirituality has nothing to do with blind faith; it is the principle of awareness that dispels darkness. Science air-conditions the outer world, spirituality air-conditions the inner world. Faith is the foundation of everything. If you want your suffering to end, pray that your desires are eliminated. Real faith is faith in one’s own Self. Even if we believe in an external God, in actuality this God is inside of us; it is our own true self. Faith and self-confidence are interdependent. Optimism is the light of God. Today’s friend may be tomorrow’s foe. The only friend we can ever really trust and take refuge in is God. While the momentary happiness obtained from the world ultimately pushes you into the throes of never-ending sorrow, spiritual pain uplifts you to the abode of everlasting bliss and peace. Pain in the beginning is the price you have to pay for the happiness you enjoy in life. Even in a worldly sense, the intensity of the pain or sacrifice you have to undergo, varies according to the measure of happiness you seek. But the happiness of spiritual bliss is the highest and most everlasting. Therefore, it is very expensive, and in order to attain it, you need to give up the lower and less pleasure-giving things. In order to gain pure love and the highest form of bliss, one has to undergo purification. Purification is heating up the mind in order to remove all impurities and this process inevitably involves pain. It is the faith and devotion of people, not rituals or ceremonies, that fill temples with spiritual energy. The hidden power of God is the cause of all that is manifest. If you have enough faith, any water can become as holy as the Ganges River, but without faith, the Ganges is nothing but ordinary water. Death is part of life. All of us must face it today or tomorrow. The important thing is not how we die, but how we live. Just as the footprints of all animals can fit in that of an elephant’s footprint so too the essence of all scriptures is contained within the Gita. Our roads and homes are becoming bigger and bigger, but our minds and vision are becoming narrower and narrower. The divine is present in everyone, in all beings, in everything. Like space, God is everywhere, all pervading, all powerful and all knowing. God is the principle of life, the inner light of consciousness, and pure bliss awareness. It is your very own Self. You can understand the secret of bliss when you contemplate the nature of the Self. When the waves of the mind subside, you will see that everything you seek is already within you. Whenever you feel inspired and have the time, sit in solitude and try to visualize everything as pure light and bliss consciousness. It is good for spiritual seekers to spend some time looking skywards. Beholding the vastness of the sky, try to merge in that formless expansiveness, where there is only undivided bliss. Look within, observe the thoughts, and trace them back to their source. Always be convinced, ‘I am the nature of Sat-chit-ananda (pure being awareness-bliss). Spirituality is all about feeling and participating in the problems and pains of others. Develop the ability to stand back as a witness to your thoughts. This will make your mind strong. Each thought and action has the power to brighten or darken many lives. If you remember God and chant your mantra, you will quickly become calm and peaceful. The sorrows of others should never become our happiness. Nor should their happiness bring us sorrow. Truth and compassion towards all beings are the twin peaks of human existence. Try to make others happy; don't despair over all the evil in the world. Instead of cursing the dark, let us each light one small lamp. Never waste away the time in hand. Don’t think that it is easy to contemplate on the Divine in the final moments of one’s life. Love is the only medicine that can heal the wounds of the world. In this universe, it is love that binds everything together. As this awareness dawns within us, all disharmony will cease. Abiding peace alone will reign. Worrying about the future, you are unable to enjoy the present. To finish off reason is the place of reasoning in spirituality. Intellect cannot experience love, for love is silence. Intellect is always noisy. Only faith can know love. Faith is in the heart. Therefore, only faith springing forth from the heart can imbibe the silence of love. The mind full of thought is ignorance; the same mind devoid of thought is Atman, the Self. People are so identified with the body that they miss the Reality, the Essential Principle. They see the waves and forget about the ocean. They see only the clouds and miss the vast expansive sky. They see the flower and fall in love with it, but they overlook the plant. The waves come and go, appear and disappear, but the ocean remains the same. The same can be said about the clouds in the sky and the flower on the plant. People miss the Reality, the Substratum, which is the enlivening principle, and this is a big loss. To forget it is the biggest loss. Today the phase of human life known as youth is disappearing. We jump straight from childhood into old age. In fact, youth is the bindu – the center point of life. It is a time when we are neither child nor adult. It is a time for living in the moment as well as the ideal stage for training the mind. But is the present generation properly making use of this period. Religion and spirituality are keys meant to open our hearts, enabling us to view everyone with compassion. Due to our lack of discrimination, the very keys meant to open our hearts are locking them shut. The foundation of all positive change is true education. We should eliminate the egoistic notion that our life will become fruitful through human effort alone. We should bow down. Only then will the power supporting the cosmos flow into us. Someone who has discarded all desires, alone, is a perfect one. How you do a thing is more important than what you do. When obstacles appear in life, we need to kindle our inner strength and spread the fragrance of selflessness and love. Devoid of discriminative thinking, knowledge is incomplete, like word without meaning. Faith in higher power helps us to control our mind and thoughts. When action is performed with awareness and compassion, it accelerates one’s spiritual journey. Fundamentally, what everyone needs is mental strength and self-confidence, to manage the mind just as we manage the outside. Today, because of the communication between machines, even people in far off places seem very close. Nevertheless, as the communication between hearts is absent, even those who are physically very near to us are really very far. The beauty of society lies in the communication between hearts. Rowing a boat against the current is difficult, but if there is a sail it becomes easy. Love for God is like a sail that helps the boat go forward. Never return anger with the same. An angry person needs to be calmed down, not aggravated. Stop identifying with the world created by your mind, and a new world will open up before you. When difficult circumstances arise in life don’t run away in fear, rather kindle the love within and try to overcome them. A much more dangerous virus than Ebola is devouring countless lives every day. This is the virus of hatred. The beginning and end of spiritual life is compassion. The world includes us as well. Thus, we should see that we are also playing a role in making this world better or worse. Devotion to God and compassion towards the poor and the needy go hand in hand. They are like two sides of a coin. No one knows how long one will live. Therefore, as soon as possible, we should complete all the good actions we are supposed to. Along with knowledge about the world, we have to understand ourselves. Only then will our education be complete. Just as the sun doesn’t need the light of a candle, God doesn’t need anything from us. Helping the poor and needy is true prayer. Without compassion, all our efforts will be in vain—like pouring milk into a dirty vessel. May the tree of our life be firmly rooted in the soil of love. Let good deeds be the leaves on that tree; may words of kindness form its flowers; may peace be its fruit. We all have knowledge but not awareness. We must wake up within. Inner growth is real growth. Only then will we start gaining awareness along with knowledge. You must become aware of the consequences of each of your actions. Then you won’t do anything wrong. Most of the wrong things we do are done due to lack of awareness. Therefore, we should always think about the consequences of an action before doing it. Life does not become meaningful by chasing after sense pleasures like animals. It only becomes meaningful when we spread happiness to others. Love can never be tiring or boring. It keeps filling your heart with more and more energy. Every failure is a lesson for us to learn from. Be a beginner, a child, in front of God, in front of the divine. Attaching oneself to the transient nature of the world is the cause of all sorrows and sufferings. The factor stringing together individuals, society and nature is missing from today’s educational system. That factor is spiritual values. Only when we serve others with the right understanding and with love and faith, will we be happy and peaceful in life. If you are not able to give material support to those in need, give a smile, a loving word and a compassionate look. Lessen the quantity of unnecessary thoughts and allow more space for the energy of love to flow within you. Always remember that when dusk arrives, it already has dawn in its womb. Love is the ambrosia which adds beauty and charm to life. Patience, love and forgiveness are the three needed qualities to maintain a good relationship. When we are knocked down, spirituality helps us get back on feet. When understood deeply, painful experiences have a positive effect on our life. Always have the attitude of a beginner. A beginner is open receptive and innocent like a child. Devotion, like tincture used for cleaning a wound, purifies the mind. Our knowledge of wisdom is limited to words; to bring it into our experience is possible only though devotion. If you cannot find free time to spare for acts of worship, try to be like the Gopis (in Krishna’s Vrindavan). They were continuously thinking of God while immersed in their work. There are two types of poverty in the world, financial poverty and the poverty of love; the second is more important. I want to awaken motherhood in both men and women. Motherhood (selfless love) is something that is fast disappearing from the world. We should tell children while they are very young that there is a power known as God who controls everything. If we teach a child to remember this divinity in all circumstances of life, that child will be able to keep his or her inner poise in every situation, whether it be victory or defeat. Whether you are living all alone or with a family, your life will not be happy and successful unless you have the mental capacity to adapt to any situation. This is one of life's most basic principles. A smile, a glance filled with sympathy or a word of solace, is enough to change one’s life. To give this, we should have a good heart filled with love and happiness. One should not forget this. Children are always found to be happy because they live in the present moment. That is the true source of spirituality. Such happiness would remain both in favorable and adverse situations. One should be a model for others through their words and deeds. One should not bring hurt or pain to other people through his actions. The body will exist as long as there is desire. When one body is given up, another will be gained. The body is the representation of desire. Desire is of different kinds. There is no harm in the desire to know God. Not only that, that desire must be there. To attain God, spiritual practices should be done. The body is needed for that; therefore, the thought to give up the body is wrong. Action won't have the flavor and beauty of selflessness, if one takes pride in one's achievements. Pride is another form of ego. Amma prefers to be a sweeper who sweeps human minds, rather than becoming a leader. Is it not the mind that has no peace? Eliminate the mind. Thus the problem is solved. It is the body that is coming and going, the Self remains unchanged. From birth itself Amma knew that God alone is the Truth and that all that is seen is not true. She could see Her own reflection in each and every object as if in a mirror. Ultimate goal is to see God in everyone. If not, at least have love for everyone. If not, at least not to get angry with anyone. Beginner's attitude, childlike innocence does not mean weakling and immature. You have to be strong and assertive if the situations demand. But be as open, attentive and receptive as a child. This is the only way to imbibe wisdom and knowledge. Attitude of a beginner is the first step in spiritual journey. When the sleeping child within us is awakened, our innocent nature emerges and we will feel a desire to learn from everything. Patience, awareness and attentiveness will follow of their own accord. It is only we who create our own prisons and imprisonment. Nobody else is responsible for that. Love is the medicine to overcome the disease of anger and selfishness. Anyone can do good actions. We should make sure that the flame of compassion in our hearts doesn’t go out. The words and actions that are borne out of compassion can even overcome death. All the mahatmas have stressed on two things – Love and Faith. The rest is commentary. The relevance of spirituality is only while living in the world. It cannot be practiced after we are dead and gone. Anything that cannot be achieved while living cannot be achieved after death. Liberation is attained in different births according to each one’s course of karma. When one body is given up, another will be gained. To attain God, spiritual practices should be done. The body is needed for that; therefore, the thought to give up the body is wrong. Soap is available, but just because it is there, it doesn’t necessarily mean that everyone will use it. Only if you use the soap will you get clean. In order to win the competition of life, all of our goals and pleasures need to remain within the boundaries of dharma. Then life will be beautiful and full of happiness. First, the human mind should be harmonized, then harmony of Nature will spontaneously take place. When you correct your inner vision through spiritual practices, the already – waiting light of pure knowledge will dawn from within. The shell around the seed has to break before the tree can emerge. You have to get rid of the ego before you gain knowledge. Look at the optimism of Nature. Nothing can stop it. There are two important days in our life. The first is the day we are born. The second is the day we realize why we are born. But for many people, this second day never comes. They live mechanically from the day they are born until the day they die. We will only be able to appreciate the beauty and magnitude of life when we realize its true purpose. Worrying has become second nature to us. Once a thought enters our mind, it quickly establishes a dictatorship. Soon, we lose our freedom to think in a discriminating manner with the result the mind becomes a slave. When a virus infects a computer, we are unable to access information in our folders or files. Such is the condition of our mind, infected with unwanted thoughts. To enjoy freedom, to be more aware, we need to liberate the mind from needless thoughts. Most of our phones have a caller identity option. With this, we can see either the name or the number of the person calling us. We can accept the calls we want and ignore the calls we don't. Similarly, when we develop awareness, we gain the ability to accept and nourish healthy thoughts and reject bad ones. Through awareness, we can even develop the ability to witness all the various functions of our mind and, ultimately, realize our true Self. The wealth that parents really need to impart to their children is culture and proper values. Progress can be slow and gradual. Continue putting in effort with patience, enthusiasm and faith. Whether you are a family man or a monk, the most important is how you look at life and its experiences. In today’s world, people’s thirst for outer success is becoming unhealthy and is causing us to lose our sense of fair judgment. Spirituality is receptivity, the ability to accept all experiences of life without reacting to them. We should gain control over our mind as we do to a TV using the remote control. If we let go of our likes and dislikes, we will become fit vessels to receive the God’s ever flowing grace. Our mind is restless because wherever we go, we find fault and look for defects in others. Spiritual education gives us the ability to face life’s challenges with courage and equanimity of mind. We should become aware of our negative tendencies and weaken them through good thoughts, not by fighting them. The ability to retain equanimity of mind in all circumstances is what makes a successful life. Be engaged in the world, but with a detached attitude. In the name of competition, we should not develop feelings of hatred and revenge. We cannot bring back the dead. We can only pray that their souls find peace. The ones who really need our prayers are those left behind. Daily prayers will give the children the kind of relaxation and concentration they require. Devotion for the Lord and compassion for the world are two sides of the same coin. It doesn’t matter if one believes in God or not as long as he or she serves others. If you try to run away from your shadow, you will simply collapse due to exhaustion. Face the difficulties of life through Love and faith. Thoughtless words, non-discriminative actions, anger and impatience always create problems. Intellect and reasoning are necessary, but we should not let them eat up our heart. Anything lost can be found again – except for time. Understanding this, we should live every moment with awareness. We must put forth effort, but we must also pray for grace; that is the deciding factor. Learn to be considerate. Don’t be obsessed with what you think is right. Look at Nature. Nature is a book from which we must learn. Each object in it is a page of that book. Peace is not a product of an intellectual exercise. It is an inner blossoming that occurs with meditation. All prayers and remembrance of God or Guru remind you of the great truth that you are not a separate entity. Strive to maintain a humble attitude by remembering God’s energy behind everything. For the mind to become as expansive as the universe, cultivate the innocence and humility of a small child. Be like a child. Only then will you be able to learn and grow. Humility makes you receptive to all experiences without judging them. Thus, with humility you can go deeper and learn more. The real mistake humans have committed lays in the inability to differentiate between requirements and luxuries. Just as armor protects the soldier, spiritual knowledge protects us from the difficulties of life. Our true nature is like the sky, not the clouds. Our true nature is like the ocean, not the waves. Clouds and waves come and go. The sky and the ocean remain. Our lives depend on the well being of the whole. Therefore, it is one of our foremost duties to lovingly care for all living things. See how easily nature overcomes obstacles. If there is a stone in the path of a tiny ant, the ant just walks around the stone and continues on its way. If there is a rock where a tree is growing, the tree simply grows around the rock. In the same way, a river flows around a log that is blocking its path. We, too, should learn to adapt to all the circumstances in life, overcoming them with patience and enthusiasm. To worship everything – seeing God in all – is what religion advises. Such an attitude teaches us to love nature. If we penetrate deeply into all aspects and all areas of life, we will find that hidden behind everything is love. We will discover that love is the force, the power, and inspiration behind every word and every action. This applies to all people, irrespective of race, caste, creed, sect, religion, or of what work people do. Pure love makes you feel as light as a flower. You won’t feel any heaviness or burden. Ego creates the burden. Beauty lies in the heart. Love towards everyone gives real beauty, enhancing both the giver as well as the receiver. The loveliness of our eyes is not in the eyeliner, but in a compassion filled glance. The smile that lights up a face brimming with love is the most beautiful in the world. Am I really in love, or am I too attached? Contemplate on this question as deeply as you can. Most people are craving for attachment, not real love. In a way, we are betraying ourselves. We mistake attachment for love. Love is the center and attachment is the periphery. Aim for the center. Most of us are always thinking about the losses in life. We forget about the greatest gain that we can have – that is love. Let your mind open up fully, and you will experience love all its fragrance and beauty. The sun gets concealed by the clouds. In a like manner, God is concealed by our ego and vasanas (latent tendencies). He becomes visible when the dirt of those tendencies is removed. The weeds should be removed or the seeds will be destroyed. If we do sadhana (spiritual practices) without eradicating the ego, our sadhana is fruitless. Patience is a great asset. Patience is the antibiotic that destroys the germs of bad feelings like anger. Patience helps us to have a proper perspective of the thoughts that we entertain. If a person commits a mistake, we should not abhor the person but the mistake. Even if we have to punish a person, deep within ourselves we should have love towards him. Skill alone is not enough for success. In addition to skill, we also need proper understanding and knowledge of the task at hand. We also need patience. If we sow a seed and then regularly dig it up to see if it has germinated, it will never grow. Initially, there may seem to be no hope, but if we are patient and persevere, then in the end the flower of life will blossom. Due to our impatience, most of the time, we aren't even aware of what we are doing or saying. Rather than feeling depressed about the opinions others may have about us, we should transcend our own limitations and try to do what we must with an optimistic attitude. Thus, patience, constant enthusiasm and firm determination to reach the goal are all necessary factors for success. Patience is needed for success. If we sow a seed and then regularly dig it up to see if it has germinated, it will never grow. When you get angry, you lose energy through your eyes, nose, mouth, ears and every pore of your body. Only by practicing mental restraint can you preserve the energy gained from sadhana. You won't benefit from sadhana if you do spiritual practices while harboring anger and pride. It is like a flashlight running on batteries that looses all power after being turned on a number of times. Doing sadhana while harboring anger and desire is like drawing water from a well with a bucket full of holes. When you are in the midst of an upsetting situation, can you simply observe what is happening? Can you stop thinking that someone is insulting and abusing you? Can you forget that you are being treated unfairly and let go of the wish to do something about it? Don't be abusive. Don't react. Try to realize that the real problem is not what is happening, but how you are reacting to it. During this pause, try to think of something positive, something elevating, something sweet, something that you consider unforgettable. Try to recall a pleasant event or memory. Focus all your energies, all your thoughts on that. If you can do this, you won't be bothered or angered by the ridiculous words and unbearable face of the other person. A griha (house) is an ashram or hermitage. That is how the word ‘grihasthashrami’ (householder) came into being. A griha can be converted into an ashram. An ashram is a place where people devote all their time and energy to the remembrance of God, doing selfless service and developing qualities like love, patience and respect for others. They do spiritual practices to help them see unity in diversity. Family life can also be like this. It was like this before, in the olden days. That is why a householder devotee is known as a grihasthashrami, a person who leads an ashram life while remaining in his house. He is a person who tries hard to attain the supreme goal, bliss, even while living with his wife and children. This is possible if you sincerely try. Stay where you are and do your duty with love and dedication. If you are married and settled in the world, don't run away, abandoning your job and your responsibilities as a husband or wife, and parent. Don't think that God will accept you only if you renounce all your duties and wear ochre-colored clothes. No, that is not how it is. Continue to wear the same clothes, perform your duties, stay at home, and do your work. But at the same time, learn to live within your true Self. This is the most important art that we should learn. We learn everything else but never this: the art of dwelling in our own Self. We must resolve conflicts especially between nations with science and spirituality. There is one explosive that is the most destructive of all. No machine can detect it. It is the hatred, loathing and vengeance found in the human mind. If we don’t get rid of our destructive emotions, there will be no end to war and violence. No matter what action we perform the goal should be the protection of truth and dharma. One of the main reasons for many conflicts is the separation of science and religion. The fusion of science and spirituality will help resolve conflicts and move towards light of peace, harmony and unity. Children you should think like this. Some people in their previous lives, have deposited a large amount of good deeds into the bank of karma. So until their remaining karmic savings are not exhausted, they will experience prosperity and comfort. However, others come into this life like those who have taken a loan. They now have to repay their loans. So, they will have to experience the results of their prarabhda karma, fated experiences coming as a result of past deeds, in this life time till those loans are repaid. So it is because of all these factors that some experience joy and others difficulties in life. Life doesn’t simply end like that.